China’s booming economic growth has put immense pressure on its scarce, unequally distributed and heavily polluted water resources. Wen Jiabao, a former Prime Minister, warned that water problems “threaten the very survival of the Chinese nation” . However with today’s fast-paced industrialisation and urbanisation, the country’s water demand keeps on growing and its water supply keeps on being over-used and polluted, leading to a daunting gap in demand vs supply. Future business growth and economic development in China could be dampened by water risk if companies do not begin to assess and respond to it. Not only are water-related physical risks (e.g. water scarcity, droughts, pollution) a major threat to Chinese business viability, but companies are also likely to face greater regulatory and reputational risks due to stronger water-related regulations and increased enforcement as well as rising community concerns. Given that many multinational companies have supply chains based in China, water risks in China can no longer be ignored by global brands and must be assessed and acted upon. 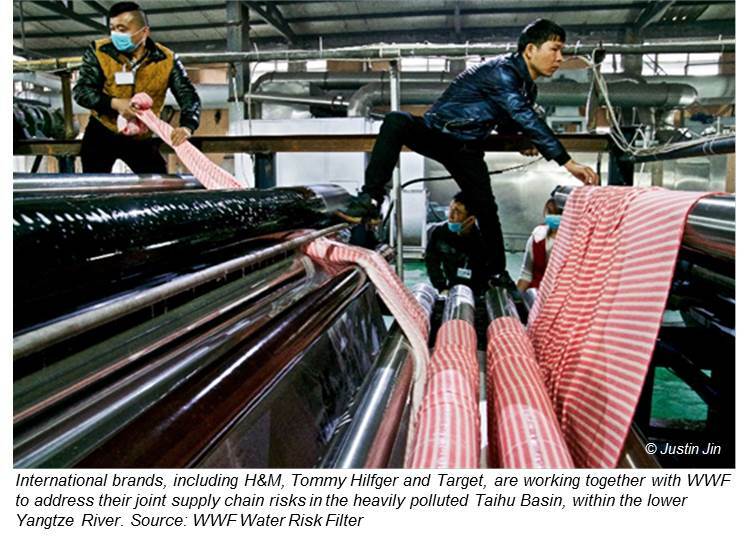 Indeed, WWF has seen growing interest to tackle water risk in China from beverage sector companies like Coca-Cola to apparel sector companies like H&M. On 31st October 2018, WWF launched the upgraded Water Risk Filter 5.0, which helps companies better explore and assess their water risks, and will soon enable them to better response to these risks. With 32 basin risk indicators and more than 12 high resolution country data sets, the Water Risk Filter’s maps section offers an array of data risks layers and at different scales from global to local. It also contains the new ability to overlay water risk layers with other aspects (e.g. population density, land cover, cropland, wetlands, and more) to explore linkages and have a better contextual overview of water challenges. 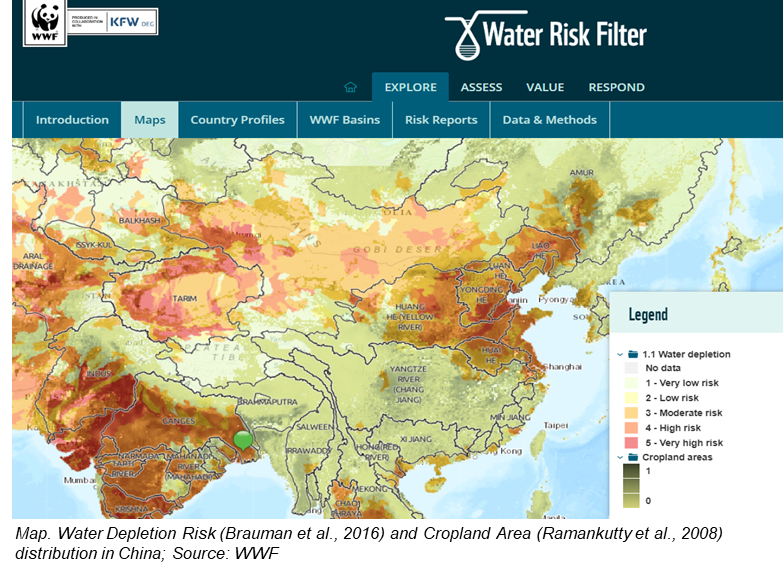 For example, overlaying the Water Depletion risk indicator and the new additional Cropland Areas layer, highlights one of the major water challenges in China: a majority of the country’s agricultural activities are in the Northeast despite it being a water scarce region. Users can also explore over 140 country profiles containing detailed information on national water governance and policies, including China’s evolving regulatory landscape with more stringent regulations, enforced with strengthened environmental law. A new feature was included to allow comparison between different countries basin risk scores and how they rank in relation to others. With a high overall reputational risk score (3.48), China ranks in the top 25 countries for reputational risks exposure. From Chinese companies wanting to assess water risks in their operations to multinationals aiming to address water risks across their supply chains, it is critical to understand both basin and operational water risk. With version 5.0 of the Water Risk Filter, the scope of the underlying data sets was expanded from 20 to 32 basin risk indicators for a more accurate basin risk assessment. The operational risk assessment was also modified to make it easier, faster, and more relevant than ever before. Recognising that the existing assessment could be time consuming, users can now opt to either conduct a rapid operational risk assessment (10 quick drop-down questions, applied to all sites), or a more detailed assessment (45 questions, applied site-by-site) depending on their needs. Moreover, the quality of water data for conducting basin risk assessment is ever improving. 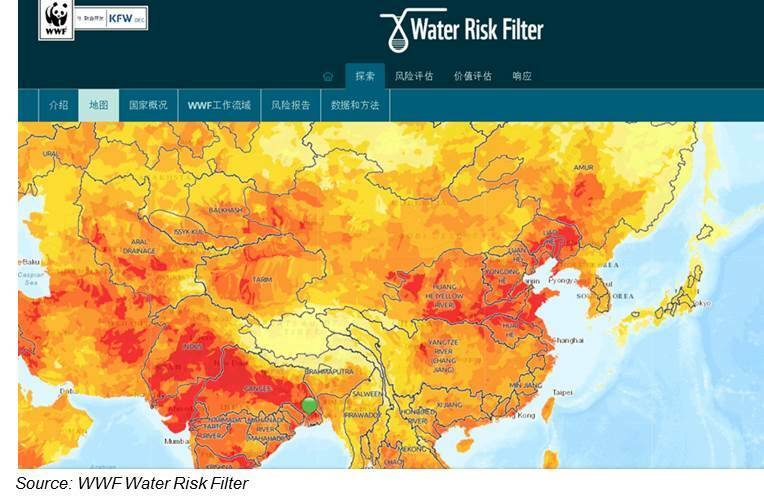 The upgraded Water Risk Filter now contains climate change projection data for droughts, floods and water discharge developed jointly with the Potsdam Institute for Climate Impact Research. By partnering with RepRisk and GlobeScan, additional data was included to highlight the potential for conflict and lack of corporate trust to influence reputational risk. Perhaps the most exciting aspect of the tool is what will soon go live in early 2019. The upcoming Respond section will dynamically link the water risk assessment results for any given site (or a portfolio of sites) to provide a customised set of mitigation response actions. The recommended response actions are aligned to leading water stewardship frameworks (e.g. Alliance for Water Stewardship, Ceres Aqua Gauge, CDP Water Security). Moreover, each action is assigned to one of ten categories that are aligned with the categories within the CEO Water Mandate Water Stewardship Toolkit, to allow users to easily access relevant supplementary materials and guidance for each action. To become a leading water steward, mitigating water risks requires engaging with other basin stakeholders in collective action. The new Respond section will provide guidance to companies on how to start engaging in collective action as well as other categories of actions related to water awareness and internal capacity, strategy and business planning, water governance, and more. While online the Water Risk Filter will offer 50 actions, an additional 100 actions are available for those who are keen to engage with WWF to help tackle water risk. Lastly, later in 2019, the Water Risk Filter 5.0 will go live with its final section: Value. While a new section that maps GDP facing water risk is already live, soon this section will help to enable appropriate approaches to valuing water, while also providing a new calculator to estimate financial value potentially at risk from water events. Already a trusted practical online tool used by thousands of companies to assess hundreds of thousands of sites across the globe, the new features of the Water Risk Filter will help companies to progress on their water stewardship journeys – moving from assessment to response on water risks. For more information or to start using the tool today, click here. WWF’s Stuart Orr on the Water Risk Filter – WWF’s Stuart Orr on the newly launched Water Risk Filter Tool. The tool is free and helps companies & investors assess exposure to water risks in their industry and basins where they operate and invest. 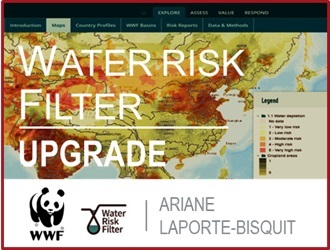 As the Water Risk Filter Manager, Ariane is responsible for overseeing the ongoing evolution and implementation of the Water Risk Filter strategy. She leads on the engagement with investor and corporate users of the tool in collaboration with the wider WWF network. Ariane holds a BSc in Biological Sciences from the University of Edinburgh and a MSc in Environmental Technology from Imperial College London. Have Investors Incorporated Climate Risks Into Portfolios?